Since 2001, Rosoboronexport has delivered munitions worth over $10 billion to Latin America. LE BOURGET (Sputnik) – Russia's state arms exporter Rosoboronexport is ready to compete with US and European arms manufacturers on the Latin American market and uses all the modern marketing tools to promote Russian weapons systems, Rosoboronexport Director General Alexander Mikheev said Wednesday. "In recent years, the US and European arms manufacturers have significantly enhanced competition in this region, however, we are ready to compete for the customer. We are using all modern marketing tools for this goal. We offer flexible financial schemes, including offsets, trade-in, individual approach to each customer," Mikheev told reporters on the Paris Air Show-2017 sidelines. Since 2001, Rosoboronexport has delivered munitions worth over $10 billion to Latin America, Mikheev said. This region amounts to over 9 percent in the total volume of exports of Russian military products, the Rosoboronexport chief pointed out. "The largest part of this volume is occupied by aviation and helicopter hardware," Mikheev added. Rosoboronexport is among the world’s largest arms exporters, selling weapons to 116 countries, according to the organization’s website. The 52nd week-long Paris Air Show in Le Bourget will run until June 25. 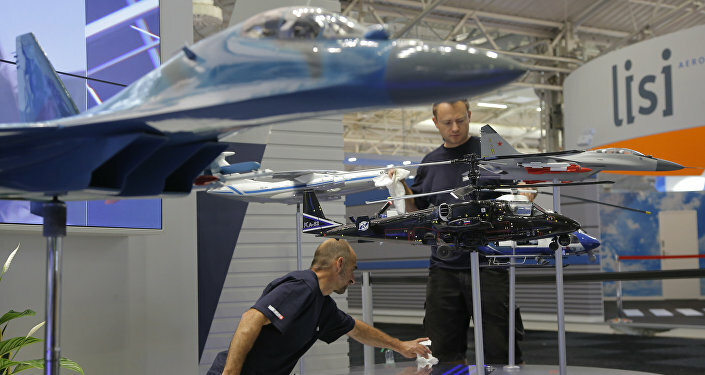 The show assembles aviation market players and experts from different countries, and will be open to the general public during the event's final three days.